Artists were invited to display work inspired by isolated, untouched or remote landscapes that they loved. The exhibition takes its title and the themes initial inspiration, from the 1937 film by Michael Powell of the same name, which depicts life on a remote scottish island. Gareth Buxton, Lesley Birch, Winifred Hodge, Pamela Knight, Catherine Sutcliffe-Fuller, Heather Gatt and Ian Scott Massie. 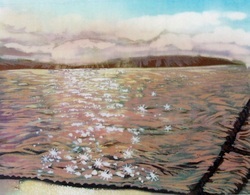 Heather uses Batik - a method of painting onto fabric which uses liquid wax to resist the dyes in places - to create her pictures. This process takes a long time as the picture is formed from layers and layers of wax and dye. 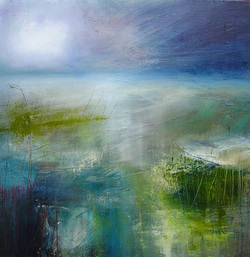 What results is a delicate, soft-focus landscape made up of many carefully layered colours. Heather's work for this exhibition explores Swaledale and the coast. Ian lives and works in Masham, though is originally from London. Inspired by artists such as Paul Nash and John Piper, Ian's paintings and screenprints explore weather, light and history in order to capture the spirit of a place. Subjects featured in Edge of the World include Slatburn Pier, Middlemoor and the dales (pictured). 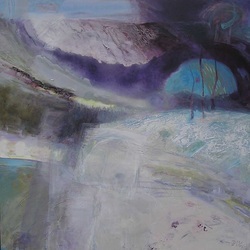 Pamela's work is chiefly inspired by the Yorkshire Wolds - an area in which she often walks and sketches. Using paint, printmaking, and sometimes a combination of both, Pamela explores the wild and ever-changing nature of the landscape. 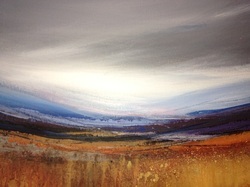 Pamela is based in York and exhibits work in galleries across the country. Lesley lives in York, though is originally from Scotland. Using a mixture of media, from oil and acrylic to monoprint and collagraph, Lesley's work combines the real with the imaginary, starting with a rural or coastal landscape and developing her ideas into a picture. As a result Lesley's work has a dream-like feel, sometimes featuring figures, hinting to an untold story. Lesley felt inspired by the exhibition's title, and has produced a new body of work specifically influenced by the exhibition's concept, and by the film The Edge of the World. Gareth lives Derbyshire and for Edge of the World, has explored the ever changing weather across the Wolds and local moorland. Gareth’s paintings are never literal reproductions of the landscape, instead he prefers to mix what he sees with his mood and the weather which particularly interests him. Winifred now lives in Edinburgh but spent many years in the Yorkshire dales, where she painted and taught art workshops. Winifred's landscapes are recognisable by their expressive stokes and stunning colour combinations, which create movement in an otherwise still setting. For Edge of the World Winifred focused on some of the beautiful islands around Scotland. Catherine is a printmaker, working in collagraph and linocut, often producing large, intricate hand-finished pieces. 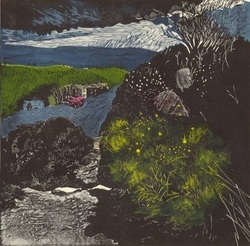 Inspired by the landscapes around where she lives in York, Catherine's prints have been exhibited in exhibitions around the country, including the Royal Academy Summer Show this year, and a piece of her work was recently selected for the partlimentary arts collection. For this exhibition Catherine has been inspired by local ramblers and the public footpaths which snake their way through Yorkshire.